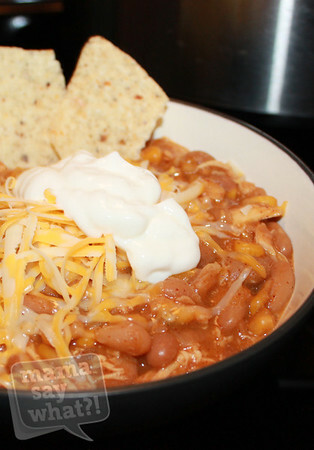 Slow Cooker White Bean Chicken Chili Recipe Mama Say What?! | Mama Say What?! Now that I am back to work full-time, I like to take full advantage of using my crock pot so I have little prep to do for dinner time when I get home at the end of the day. Chili is a favorite in our house but I wanted to try something different from our normal ground beef concoction. I came across this recipe on Pinterest and thought I would give it a try. Not only is this recipe super yummy, but it is so easy to put together before leaving for work in the morning! 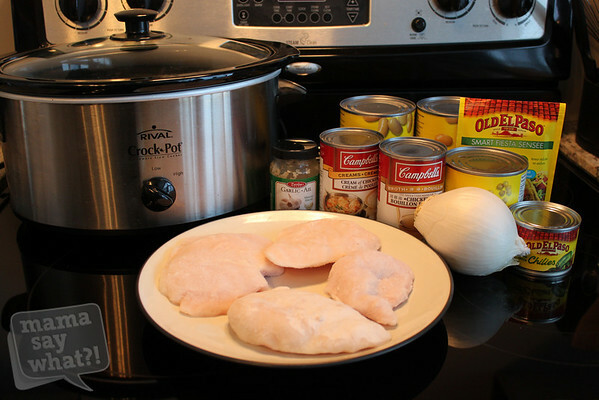 -Spray your crock pot with non-stick cooking spray and place the chicken breast on the bottom. -Top your chicken with the beans, corn and onion. 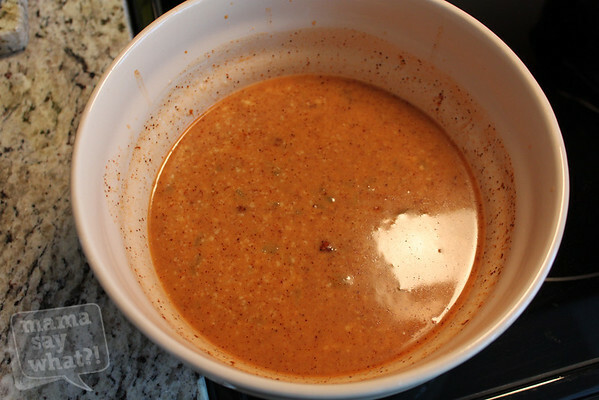 -In a bowl, combine the garlic, taco seasoning, green chilies, soup and broth. I used a whisk to help break up the creamy soup. -Once mixed together well, add the liquid to your crock pot and give everything a good mix while trying to leave the chicken at the bottom. -Cover and cook on LOW for 8-10 hours. When I walked into our house after work, it smelled amazing! I knew we were in for a very yummy dinner. Before serving the chili, use a potato masher to break up the cooked chicken. This will help to thicken up the chili. Serve into dishes and top with grated cheese, sour cream, cilantro and tortilla chips… or anything you feel like using as a topping. Added by Kathy S. on April 19, 2013. You won’t be disappointment Mary Ellen! We do a really similar recipe that I absolutely LOVE!!! Sometimes we use rotisserie chicken already cooked from the store if we want to do it quickly on stove top. Yum…may need to try the slow cooker version! 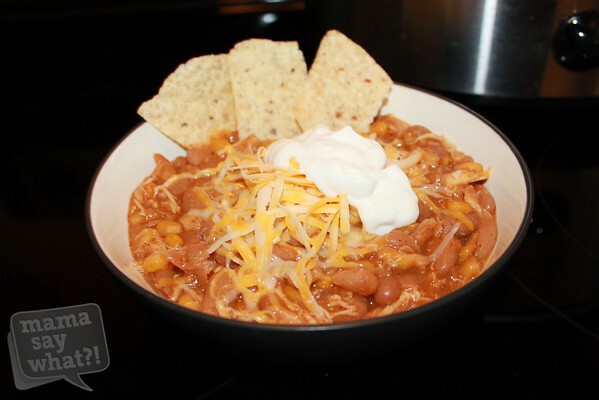 Pingback: Chicken, White Bean & Corn Chili Recipe Mama Say What?! | Mama Say What?! This so yummy, a great camping meal! Thank you! I take it you don’t add the juices from the cans?? No. I drained the beans and corn before adding them in. Great question! If I don’t have the time to cook this in the crackpot,would it still taste the same if I cook it on the stove top? Erica, I am sure it would… you may need to adjust cooking time and the amount of liquid. 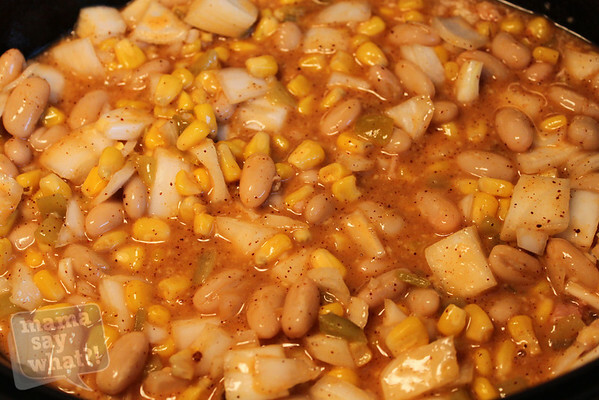 We also have this Chicken, White Bean, and Corn Chili that is made on the stovetop. Trying this recipe today! It’s a bit gloomy and breezy out so making this for the family! You can use dry, but you have to sort through them to pick out any debris, soak them (if you want) for 12-24 hours in hot salted water, then cook them, since canned beans are basically cooked beans. 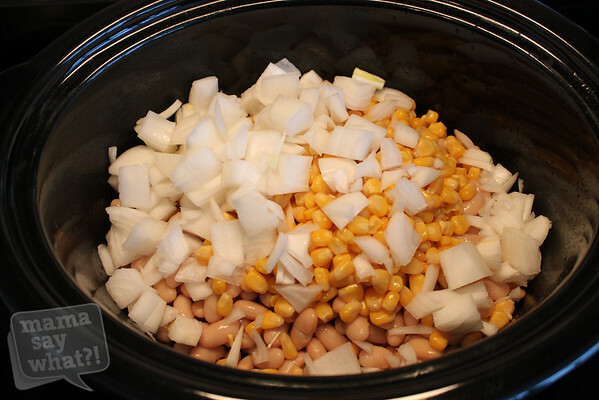 Depending on the bean, use 1/2 to 2/3 the amount of cooked canned beans. A 15 oz can of canned beans = about 9 oz dried beans (1.5 cups). If you would prefer to skip the soaking process, just rinse them thoroughly and then add about an hour of cooking time. Check your slow cooker every now and then. I don’t have experience cooking with dry beans, so I can’t say for sure whether or not they would work. You can always substitute for other beans that you like. I have used red kidney beans before when I couldn’t find the white ones. Can you cook the chili on high for 4 hours rather than on low for 8 hours?? This is such a delicious recipe! I’ve made it several times now and I’m always pleased! Thanks for the great recipe.